Download the Gujarat Police Call Letter 2018 which was released on 20th November by the authorities of Gujarat Police Department its official website on ojas.gujarat.gov.in. Gujarat Police Exam will be held on 02nd December 2018. Aspirants who want to attend the written test they can download the Ojas Gujarat Police call letter from our site. Candidates can check the Gujarat Police Constable Exam Date on this page. The Gujarat Lokrakshak Call letter is having the exam details clearly. for more details regarding the Gujarat Police Call Letter, you can read the full post. 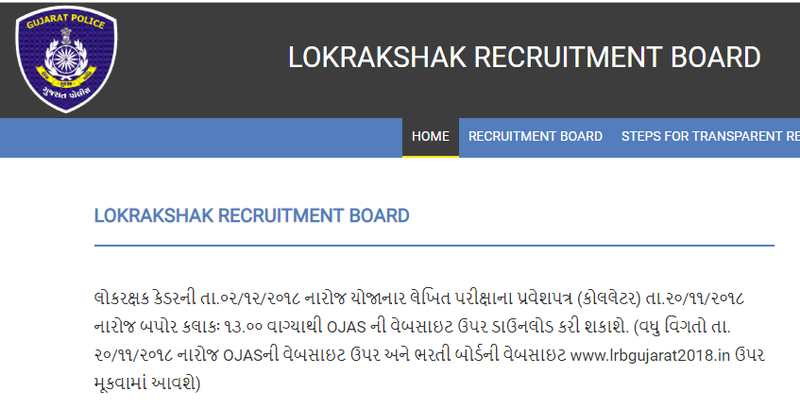 According to the Lokrakshak Recruitment Board Notification LRB/201819/1, the recruitment process will consist of Written Examination, Physical Efficiency Test (PET), Medical Test and Personal Interview. Now as per official notification, Gujarat Police examination date for written exam is to be fixed by the board. 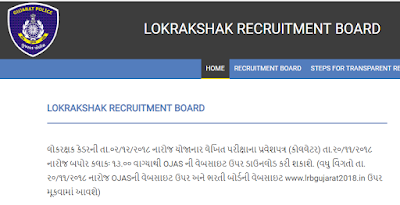 Gujarat Lokrakshak Recruitment Board (LRB) from 20th November 2018 will issue written exam call letter for Un-Armed Constable, Armed Constable and Jail Sipahi posts through their official website. Large numbers of eligible candidates have registered under this recruitment drive of 6189 vacancies. Now, they all candidates able to download the Lrbgujarat2018 call letter from the direct link given below. How to download Gujarat Police Bharti Exam 2018 Call Letter? Step 07: Download and Save Gujarat Police Call Letter 2018 for further use.